"I'm almost half the person I was!" "There was a time when I wouldn't even walk to the corner shop let alone run anywhere," says 33 year old Jess, who used to weigh 18st. "When I was at my heaviest, it was so hard to exercise. I never dreamt that one day I'd be running for charity." Jess's weight loss story began when she was a teenager. "I'd been slim as a child but started to put on weight at primary school so my mum put me on a healthy eating regime," she says. "It worked, but I was obviously prone to putting on weight even then." It was in her mid-teens that weight really started to become a problem, however. Jess says she'd never eaten particularly badly - it was more to do with the sheer amount she ate that led to her rapid weight gain. "I'd get to work at 8.00am where I'd have bacon, egg and a slice of toast, followed by chocolate biscuits at 10 and for lunch I'd have sandwiches and soup, or chips and yoghurt. In the afternoon I'd have a chocolate bar and maybe some crisps too, then I'd have a large tea and a snack before going to bed. It was one continuous meal." It seemed to Jess that she'd always struggled to control her weight. "I'd joined clubs, done diets, lost the weight then put it all back on again - and then some," she says. "Luckily I hadn't developed diabetes, high blood pressure or any of the other problems that go with obesity. What I'd been doing wasn't working, I needed to be more serious about it, and I needed to look at what else I could do." Although Jess's GP had referred her to a weight-loss group, it had proved too problematic. "The sessions were mid-morning so I just couldn't do it, taking all that time off work every week. I thought, I know how to diet, I know how many calories are in every single bit of food - it's just that I can't stick to it long enough to make the difference." Jess knew someone who'd had weight-loss surgery and wondered if it would suit her too. While searching the Internet, she came across the Phoenix-Health website. "I realised they were close to where I live so went along to their open evening," she says. It was afterwards that she realised surgery held the key to unlocking her weight problem, so Jess arranged for a consultation with Phoenix-Health surgeon David Kerrigan. "He interviewed me and asked me what I wanted him to do. After listening he said he thought a gastric band would help, but there were things it wouldn't do - like stop me eating chocolate. I knew that for this to work it would be down to me making the right choices!" Jess knew surgery was what she had to do. "I realised I'd have to pay for the op myself because I wouldn't get it on the NHS. I wasn't big enough to be referred. I thought - do I have to make myself really ill before the NHS can help me? "I'd discussed the op with my family and my partner beforehand, but not with anyone else. Fern Britton had just spoken publicly about her surgery and I knew I'd hear horror stories and that people would say things that would frighten me. I knew it was right for me and I didn't want anyone to upset me or put doubt in my mind." Jess followed the special pre-op diet which saw her lose 11lbs in two weeks. "It was quite funny really. 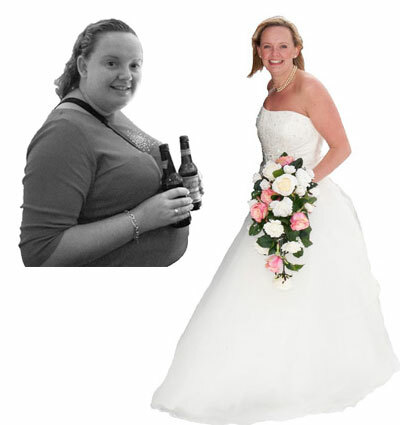 I was at a hen party in Majorca when I started the diet and I thought - here's the start of my new life, let's go!" Since the op, Jess has lost seven stone. "Now I weigh 11st," she says. "The weight fell off quickly at first, then it slowed down and levelled off to about 2lbs a week. These days I exercise regularly and my muscle tone is improving. I know my body's still changing, but it's not what I see on the scales now that's so important, it's how I feel and look." How has Jess's life changed since her weight-loss surgery? "I just feel so much better now," says Jess, who married her partner earlier this year at a truly white wedding in snow-covered Eilean Donan Castle in Scotland. "So many people have noticed the difference in me - I'm almost half the person I was! "Being obese was horrible. My weight used to affect everything I did. I felt I had to compensate by being loud and bubbly. I rarely went out socialising because I had no confidence - in clubs everyone was thin and beautiful, which just wasn't me. "Clothes shopping was awful. I'd got to a size 24 and yes, there were clothes available, but the choice at that size was very limited, especially with my height - I'm 5 feet 10." These days Jess is fitter, happier and healthier. She runs three or four times a week and plays touch rugby. She also goes to Zumba classes, has a personal trainer and has just completed her first 10k run for charity. "My husband is absolutely over the moon," she says. "He wants to take me out all the time, buy me clothes and treat me; it's amazing!" Before the op, Jess's weight problem was always on her mind. "Now, I don't have a choice - the band won't let me overeat," she says. "I can eat chocolate, I can eat naughty things but I keep this to a minimum - otherwise what's the point, I want to make the most of this opportunity. "If I eat too much, too quickly or don't chew properly, I really feel the pain so I eat carefully and have normal portion sizes. "You have to be in it to win it - by which I mean, you've got to be 100 per cent committed to changing your eating habits. It has to be in your mind all the time. The surgery is not the whole answer. If you pay out this amount of money - it was my most expensive purchase ever - you can't afford to blow it." What advice would Jess give to anyone considering weight-loss surgery? "Don't rush into it," she says. "When I first started researching I considered going overseas for the surgery because it was cheaper. But when I heard so many negative things about the lack of aftercare I thought, what if anything happened to me, who would sort it out? "I don't think 'cheap' should be a priority when you're buying something like a gastric band that is going to need surgery to be placed inside your body and then be with you for a long time. I wouldn't do it with shoes and they only go on my feet!" For Jess, the aftercare provided by Phoenix-Health has been as crucial to her ultimate wellbeing as the surgical procedure itself. "The aftercare with Phoenix-Health has been fabulous," she says. "I've never once felt alone and I never panic because I always know they are there. I've rung them at any time - you know, those worry phone calls, 'I've found a lump' or 'that's hurting or this is hurting'. There's always someone there for you." Disclaimer: Visitors please note that this feature is a paid for advertorial and WLSinfo can not be held responsible for the accuracy of the information appearing within it.